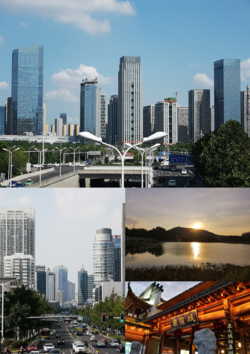 Montage of Hefei. Clockwise from top: Swan Lake Eastbank CBD, Dashushan, City God Temple of Luzhou-Fu and Downtown Hefei. Hefei (Chinese: 合肥) is a city and municipality (地级市) in eastern China. Hefei is the capital the Anhui province. It is the political, economic, and cultural center of Anhui. It is located in the central portion of the province, and it borders Huainan to the north, Chuzhou to the northeast, Wuhu to the southeast, Tongling to the south, Anqing to the southwest and Lu'an to the west. Hefei has 7.06 million people, 2.18 million of whom lives in the urban area. From the 8th to the 6th centuries BC, there were many small states in Hefei. The area later became a part of the Chu kingdom. Many archaeological finds dating from this period have been made. In the 2nd century BC, the name 'Hefei' was first given to the county set up in the area under the Han dynasty. In the 3rd century AD, the Battle of Xiaoyao Ford was fought at Xiaoyao Ford (逍遙津) in Hefei. Zhang Liao, a general of the Wei state, led 800 picked cavalry and defeated the 200,000-strong army from Wu. After this battle, Wu and Wei fought for several decades in Hefei. Hefei Municipality is divided into 4 districts, 4 counties and 1 city. This page was last changed on 3 April 2019, at 09:07.